We are leading manufacturer and supplier of Soy Protein Isolate having protein content in the range of 85%-90% & processed from Indian NON GMO clean, healthy golden yellow soya bean seeds. 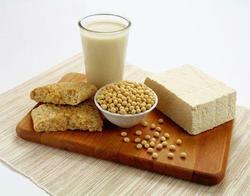 Soya protein is the protein ingredient of choice in a wide range of Food, Pharma, Poultry, Meat etc. Industries. We are a leading distributor of Soy Protein Isolate in Delhi. APPLICATIONS: IT IS USED IN WIDE RANGE OF NUTRACEUTICAL & HEALTH CARE PREPARATIONS LIKE LIQUID TONIC, DROPS, HIGH PROTEIN FOODS, BABY FOODS & ANIMAL & POULTRY FEED FORMULATION ETC. Aminospeed is a pure blend of proteins isolated from Soya, whey and finger millets (sprouted Ragi) that are easily absorbed into the serum. Finger millets are rich in protein and have high bio availability. We are leading manufacturer and distributor or Soya Protein Isolate 80%, 90%. It is primarily used in biscuits, health preparations, baby foods, & high protein foods. It is primarily prepared from deafted soya bean meal. Soy protein isolate is a highly refined or purified form of soy protein with a minimum protein content of 90% on a moisture-free basis. It is made from defattedsoy flour which has had most of the non protein components, fats and carbohydrates removed. Because of this, it has a neutral flavor and will cause less flatulence than soy flours. We are offering excellent quality Protein Isolate (10lb), which is natural and filtered twice. Our Protein Isolate (10lb) is widely demanded for its freshness, taste and aroma. Soya Protein is made from Soya hulls through spray drying route. It is an excellent source of nutrition and contains 80% -90% Protein. Soya protein contains no cholesterol. almost no fat and is low in sodium. It is high in potassium, a good source of essential amino acids. Many diverse applications as ingredients in foods, feeds, shampoos etc. We are leading supplier & distributor of Soya Protein Isolate 80%, 90%. It is primarily used in biscuits, health preparations, baby foods, & high protein foods. - It is primarily prepared from deafted soya bean meal. ISOLATION is ultra-premium Whey protein Isolate designed to provide optimum support for lean muscle, strength and exercise recovery. -Our Isolation contains Purest form of Whey Protein Isolate containing over 90% protein with a Zero Carbs and low fat (0.25g) content per serving, which is lower than most other whey protein powders, and additionally high biologically value (BV) up to 104.